Vern Hee/Pahrump Valley Times Trucks at the Las Vegas Motor Speedway come in for a pit stop at the Camping World NASCAR Truck Series. Vern Hee/Pahrump Valley Times Trucks during the Camping World NASCAR Truck series come within inches of the wall on the fourth turn at the Las Vegas Motor Speedway. It was a great weekend for the Camping World NASCAR Truck Series as I saw Ben Rhodes in his number 27 car take the checkered flag for Toyota racing at the Las Vegas Motor Speedway on Saturday night during the 2017 NASCAR Truck Series. It was definitely something to see and do during the weekend and something I would recommend to all race fans who have avoided NASCAR events for I am now hooked on NASCAR. The greatest thing about this sporting event was no one took a knee during the national anthem. All kidding aside, I thoroughly enjoyed my very first visit to the Las Vegas Motor Speedway and would go again. I went to my first NASCAR event with open eyes. There is something to be said about NASCAR and watching a group of modified production pickup trucks race around a speedway at 144 miles an hour. Some of these engines have 700 horses running in them. It was definitely worth seeing for the price. The value of my ticket was $29 for a general admission seat. The seat was great and I had no problem seeing the whole race from the middle. I could have gotten closer, but why? The noise I think would have been too deafening. I am going to have to say that I was pleased at the speed in which I was able to park my car, which was free, and how fast I was able to get into the event. I think the whole parking process and walking up into the event took me no longer than 15 minutes. It was truly amazing to see the speed and the skill firsthand required to move these vehicles on the speedway, coming within inches of the wall in turn four. Some of the trucks even touched the wall. 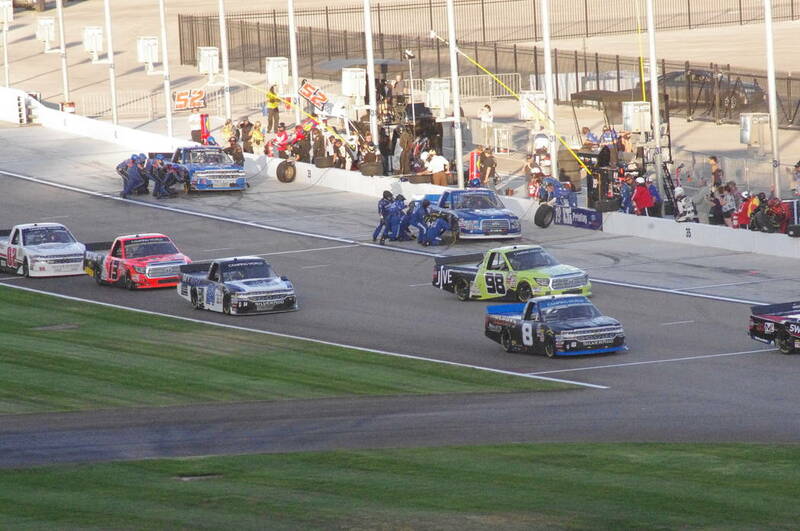 Although not as popular as the cars, the trucks had just as many high-speed crashes as any normal NASCAR event would. 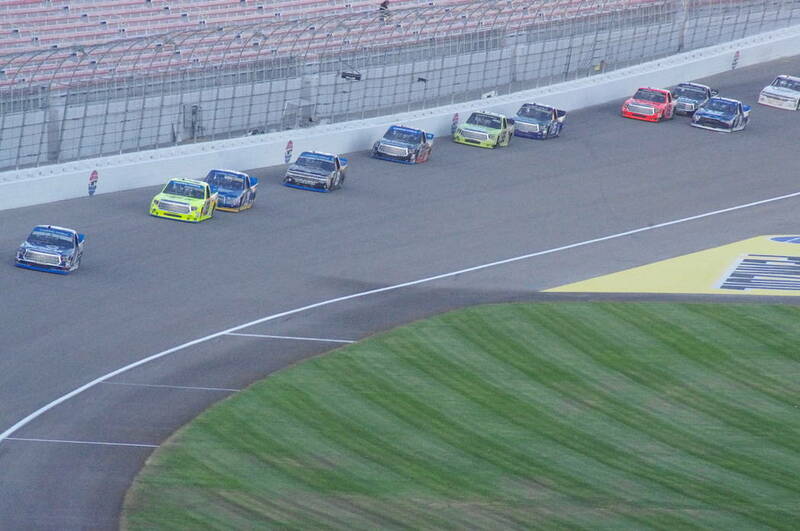 There were numerous caution flags as the trucks sped around and enough to keep my eyes riveted on the track. I was also pleased at how organized the traffic control was. I once told myself that I would never go to a NASCAR event in Las Vegas because of the traffic. I hate dealing with tons of people in a confined space. I just don’t deal well with traffic nightmares and well, I didn’t find a traffic nightmare to begin with. In fact the event was well run. My only complaint was the food was expensive once inside. People are not allowed to bring their own food and beverages in. You are a captive audience like in the movie theaters and they do take advantage of that. The prices are about the same as the movies. It was $5 for a water, and $6 for regular nachos and about $6 for a jumbo hot dog. I guess if they had refills on the drinks it wouldn’t have been so bad. My takeaway on this is to bring food to either eat after the race or before it. I saw lots of people doing what I did after the race and that was eating while the traffic subsided. NASCAR at the smaller events like the NASCAR Truck Series gets high marks from this race lover. I give it about a seven out of 10. And this means I can’t wait to go to NASCAR during the 2018 season.